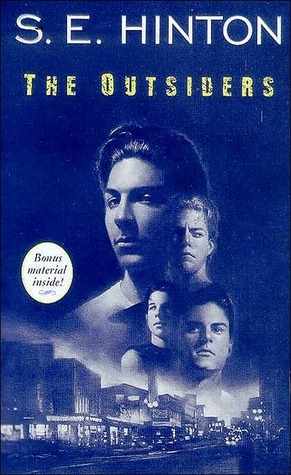 Why did I add The Outsiders to my bookshelf? I have no idea how many years this book has had a spot on my bookshelf. I am pretty sure that I picked it up at a book fair somewhere along the way. I have seen the movie a couple of times and I feel like this is one that I kind of need to read. My copy of the book only has 180 pages so I am sure that I could fly through the book in a single evening if I actually decided to read it. I really have no excuses for not reading this one yet. Who knows when I might decide to pick it up. I see books on my shelf that are slender and probably would be read in a couple hours and yet they set. LOL This is one that I saw the movie and, like you, haven't pulled down my copy of the book from my shelf to actually read it. Every once in a while I will read a bunch of shorter works when I am not in the mood for a longer read. I will need to remember that we have this book the next time I am looking for something short. I have a vague recollection of watching the film as a young teenager. I can't remember now which of the stars it was that I had a huge crush on at the time! This movie has so many big stars in it! I have always been a Patrick Swayze fan but I think he was the older brother or something. Honestly, I don't remember a whole lot about the movie anymore. I know I read this as a kid after I became addicted to the film! There was a guy I fancied at school who looked so like Ponyboy! Lots of gorgeous guys in the film too! This movie had all of the big stars! This book is a classic and so, so good. This story just got me in the feels. Just what I wanted to hear, Sam! I forgot that we had a copy. I barely remember the movie so I think I should read the book before watching it again. I couldn't believe that this book is already 50+ years old! I read this book as a teen years ago, and it stuck with me. Great book, great characters. I'm sure the writing style would feel awkward to today's readers, but so that's okay, it's still a great book. Perfect, Priscilla! That makes me a little more eager to pick it up. It wasn't until more recent years that I found out that the movie was actually based on a book. I remember loving the movie but I've never read the book. Good luck with it if you read it!! I read it back in 8th grade and I'm pretty sure I liked it. I wonder how it ages. I also wish the author would stop complaining about all the slashfiction,let people be! Oh no...I had no idea about the author! Oh I loved the book!! I read this too long ago to really remember what I thought of it. My son sure enjoyed it though. And we watched the movie together and really liked it. That says a lot, Laura! I saw the movie like a million years ago and I can't even recall much about it, lol! 180 pages would be easy to get through. Hope you enjoy it as much as the movie! Thanks, Rachel! I don't really remember much of the movie either. I've seen the movie and enjoyed it, but haven't read the book. I can't even remember what I thought of the movie anymore. I was kind of surprised to find that I had a copy of it! I read this book so many times as a kid. I loved Ponyboy. I remember watching the movie too. I hope you get a chance to read this one. You will fly through it. The Outsiders is one of my favourite books and I am so impressed that she managed to write this one when she was so young. I love the Robert Frost poem featured in this one too. I really hope you can pick it up soon!